Két Sheng, starting from the Hungarian folk song The rooster is crowing, and arriving through the Hebrew blessing Tzur mi-shelo to the Sephardic love song Los bilbilicos cantan, has pointed out that in the Hebrew tradition not only the rooster, but also the nightingale is considered as the herald of the dawn and a symbol of the longing for the Messiah, the Savior. “We could not have rounded off more beautifully our round trip revealing the intricate network of relations between the Hungarian Hasidic song, the Sephardic love song and the pious Hebrew liturgical poem.” – he ended his essay. But the round trip is not over yet. Because the nightingale as a symbol for the soul yearning for the Savior was also known in medieval Christian tradition. And the development of this symbol looks back to such a long and organic prehistory that it is also possible: even the Sephardic song borrowed the motif from there. 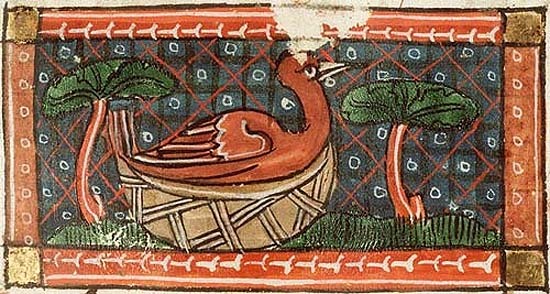 Early medieval bestiaries did not know about this allegorical meaning of nightingale yet. As we read on the “Nightingale” page of the outstanding Medieval Bestiary database, they only recorded three features for this bird. Pliny provided them with the information that nightingales start to sing in the springtime, at the leafing of the trees (as in the famous Spanish “ballad of the archer” the lark and the nightingale converse with each other “when the wheat ripens / and the fields are in flower”), organizing veritable singing competitions whose loosers often die from the efforts. Saint Isidor of Seville, with one of his usual false but genial etymologies derived the Latin name of the bird luscinia from light, lucis, as it brings the light by its early morning singing. And finally – although the Nightingale page does not mention its source – Saint Ambrose coined the widespread parable comparing the nightingale sitting on its eggs and keeping itself awake by its song, to the poor widow woman taking care of her children day and night. 13th-century Franciscan mysticism brought a new turn in the allegorical interpretation of nightingale. This new kind of religiousness, in contrast to earlier, rationalistic Christianity, laid emphasis on the personal relationship to God, on emotions, on the inner experience of the sufferings of Christ. In this it found an unexpected ally in the nightingale. Dulcius in solitis cantat philomela rubetis, sweeter sings the nightingale in the solitude of the forest, wrote the popular school author Maximianus Etruscus, and this verse became the motto of the new, introspective religiosity, and the nightingale the symbol of the soul yearning for the Savior. 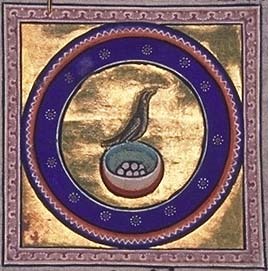 The nightingale mysticism, which in the course of the 13th century was enriched with several new motifs and which on its turn also enriched the love poetry of the courts and the goliards of the Carmina Burana, was summarized by the Franciscan archbishop of Canterbury John Peckham in his elegant Latin poem Philomena. This poem was attributed to Saint Bonaventure, and thus it became widely known and influential (fray Luis de Granada for example made a beautiful Spanish prose translation of it). In this poem the nightingale – presented with the typical formulas of Provençal troubadour lyrics – is the symbol of the monk who, incessantly singing like the nightingale of Ambrose, practices the “image meditation” developed by the Franciscans and later by the Jesuits. From night to sunrise he sings about Adam and the sufferings of the unredeemed human race, then from sunrise on the events of Christ’s life, while from three o’clock on the scenes of His sufferings and death, until at sunset he dies from sorrow and exhaustion – just like the nightingale of Pliny. Mary Magdalene, His sufferings and death on the cross. This poem by Peckham/Bonaventure was also known by Saint John of the Cross, perhaps via the verse translation of Juan López de Úbeda, and he used all the symbolic elements of the song of the nightingale on the final climax of his Canticle Spiritual. The song exhausting the nightingale is in his enumeration “the flame that is consuming and painless.” Everything is here: the sweetest solitude in “the grove and its beauty,” the announcement of the imminent and definitive salvation, the entry into a higher and luminous reality, the self-giving and final repose which is also the beginning of a new day. But where is the third, light-bringing feature of the nightingale left? The allegory did not forget about it either. 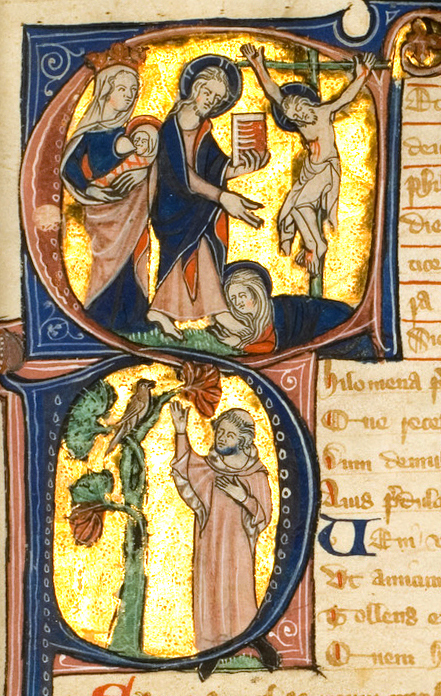 Pliny related the song of the nightingale to the leafing of the trees. And in the Middle Ages they considered that the nightingale starts to sing on Easter night as a herald of Christ’s imminent resurrection, as it was taught by the Carmen Paschale, the Easter Song of Sedulius Schottus. And, as a matter of fact, the song of the nightingale still resounds in the Holy Saturday nocturnal liturgy in the sequence Salve festa dies by Venantius Fortunatus, in which the resurrecting Savior brings to the world light, revival and leafing. And with this here we are at the object of the feast of today. We wish a blessed Easter to all our readers. Nightingale song (3'15"), from here. Another version can be found here (browse for „fülemüle”). Felices pascuas para ustedes también!